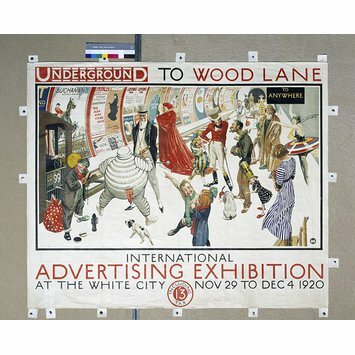 This poster was issued by London Transport for the International Advertising Exhibition at the White City, London. Humourous brand characters continued to be popular in the 1920s and some of the most famous were created by S.H. Benson. The International Advertising Exhibition featured a 'Pageant of Publicity', a procession through London of such brand characters as Bubbles, the Kodak Girl, the Michelin Man, the Rowntree's Cocoa-Nibs children and many others, some of whom are depicted here. At White City, London Underground had a stand to encourage advertisers to rent poster spaces on stations, buses and trains. 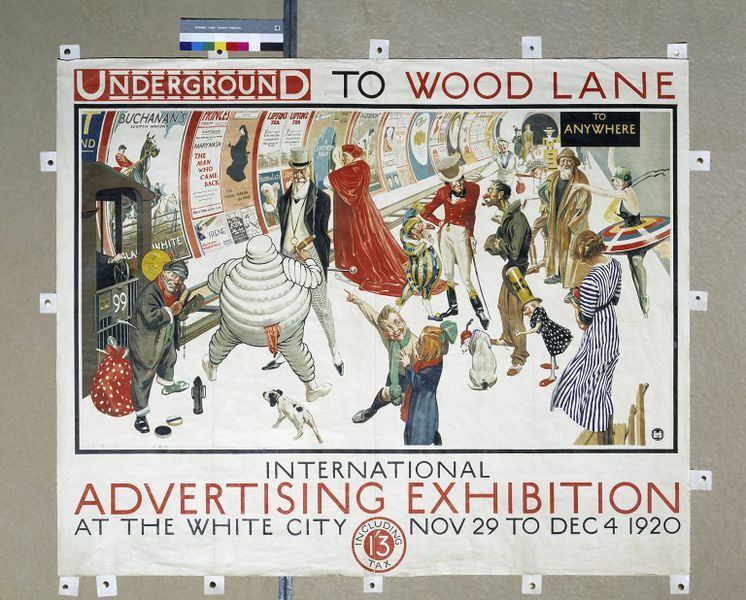 Poster by F. C. Herrick advertising the Underground to Wood Lane for the International Advertising Exhibition at White City (Nov 29 - Dec 4, 1920). Great Britain, 1920.